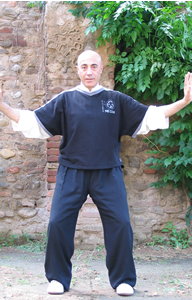 Qi Gong, the mastery of inner vital energy, includes a great variety of different styles and different purposes, from the therapeutic to the martial one to the alchemical transformation of the individual. Nei Gong means “internal work” and consists in ancient exercises of the old martial tradition aiming at developing “body intelligence” and internal strenght. They can be divided in exercises to promote the elastic force, the spiral force and the explosive force.